Lymph nodes are found throughout the body. They are part of the body’s immune system. These nodes help fight infection by producing special white blood cells. They also work by trapping bacteria, viruses, and cancer cells. 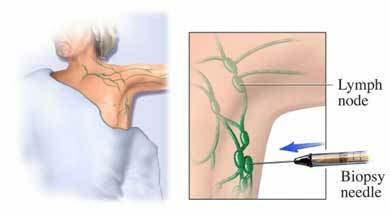 Normally, lymph nodes cannot be felt unless they are swollen. Infection, usually by a virus, is the most common cause of lymph node swelling. Other causes include bacterial infection and cancer. With this type of biopsy, the doctor removes all or part of a lymph node so it can be further examined. This biopsy is done to find out why a node is swollen. Swelling may be caused by infection, cancer, or another disease such as sarcoidosis. Any medications you take, including over-the-counter drugs and herbs and supplements. You may be asked to stop taking some medications up to 1 week before the procedure. Avoid eating or drinking anything after midnight if you will have general anesthesia. Local anesthesia—Just the area that is being operated on is numbed. General anesthesia is used for open biopsies—General anesthesia blocks pain and keeps you asleep through the procedure. Fine needle biopsy—A thin, hollow needle is used to obtain tissue samples. Core needle biopsy—A larger needle is used to cut out a piece of tissue. An ultrasound or CT scan may be used to help locate the biopsy site. An open biopsy means removing the lymph nodes through an incision. A cut will be made in the skin. All or part of a lymph node will be removed. After removal, the incision will be closed with stitches and bandaged. The sample will be sent to the lab for examination. You will have some pain and tenderness after the biopsy is taken. Your doctor may give you pain medication. Be sure to follow your doctor's instructions. Results will be ready in about a week. Your doctor will tell you if further treatment is needed. Sentinel lymph node biopsy. National Cancer Institute website. Available at: https://www.cancer.gov/about-cancer/diagnosis-staging/staging/sentinel-node-biopsy-fact-sheet. Updated August 11, 2011. Accessed April 17, 2018. Testing biopsy and cytology specimens for cancer. American Cancer Society website. Available at: https://www.cancer.org/treatment/understanding-your-diagnosis/tests/testing-biopsy-and-cytology-specimens-for-cancer.html. Accessed April 17, 2018.